John Gaskins was one of the early pioneers of Berrien County, settling along with his father, Fisher Gaskins, and brothers near present day Bannockburn, GA. They made their homes on the west side of the Alapaha River about 16 miles distant from today’s Ray City, GA location, settling there about the same time the Knights and Clements were homesteading in the area around Beaverdam Creek. John Gaskins was born June 29, 1802 in Warren County, GA. He was the eldest child of Fisher Gaskins and Rhoda Rowe, and a grandson of Thomas Gaskins, Revolutionary Soldier. When John was around four or five years old, his parents and grandparents moved the family back to Beaufort District, South Carolina, from whence they had originated. The family appears there in Beaufort District in the Census of 1810. By the time of the 1810 enumeration, John Gaskins’ parents had given him four siblings – two brothers and two sisters. But immediately following the birth of her fifth child, John’s mother died. He was eight years old at the time. His widowed father packed up the five young children and moved the family back to Warren County, GA. There, on January 17, 1811 his father married Mary Lacy. Her father, Archibald Lacy, was also a veteran of the Revolutionary War, and her brother was the Reverend John B. Lacy, who would later become a prominent Primitive Baptist Minister. Around this time John’s father was expanding his livestock business and began looking for good grazing land for his growing herds of cattle. By 1812, John Gaskins’ father moved the family to Telfair County, GA where he acquired good grazing land for his cattle. His father and his uncle, David Gaskins, were very successful in the cattle business and soon had large herds, not only in Telfair County where they were enumerated in 1820, but also in Walton and other surrounding counties where good natural pasturage could be had. Around 1821, the Gaskins again moved their families and cattle herds to the south, crossing the Ocmulgee River at Mobley’s Bluff and pushing into the new frontier of Appling County,GA. John, now a young man of 17 or 18 years old, made the move with his family. His uncle, David Gaskins, halted in an area of Appling County known as “The Roundabout”, situated in present day Atkinson County, where he found good range land for his cattle. John’s father took his herd across the Alapaha River into then Irwin County at a location that for many years was known as the John Ford. The Fisher Gaskins clan, John’s father and his brothers, settled west of the Alapaha River a little south of present day Bannockburn, GA near the site of Riverside Church. On April 14, 1825 John Gaskins married Mary Pollie Barrow in Irwin County, GA. This was about 15 miles north of the area where the Knights and Clements were settling their families above Grand Bay, near present day Ray City, GA. John and Mary Gaskins established their homestead just to the north of his father’s place. By the end of 1825, the Georgia Legislature divided Irwin County and from the southern portion formed the new county of Lowndes. On August 11, 1826 Mary Gaskins delivered to John his first son, Gideon Gaskins. A second son arrived on February 16, 1828, whom they named Fisher Jackson Gaskins; Fisher – after his paternal grandfather, and Jackson perhaps after Andrew Jackson, the Hero of New Orleans who would be elected President that year. John Gaskins appeared as a head of household in Lowndes County in the Census of 1830, as did his father, Fisher Gaskins. About 1829 or 1830, John’s father moved his cattle across the county and settled on Lot 91 of the 9th Land District, which was subsequently known as the Chambliss place, and later became the home of George D. Griffin. About 1831 a contagious disease struck Fisher Gaskins’ herd, killing off several hundred head of cattle and inciting the elder Gaskins to seek new pastures yet again. With the help of hired hands, among them a young John G. Taylor, he drove his remaining cattle into North Florida to settle in the area of Alachua County, FL. John and Mary stayed behind in Lowndes County (now Berrien), as well as John’s brothers, William and Harmon. Cattlemen like John Gaskins sold their Berrien County livestock at points like Savannah, GA or Centerville on the St. Mary’s River, or Jacksonville, Florida. John Gaskins fought in the Indian War 1836-1838, serving in Levi J. Knight’s Militia Company. Georgia historian Folks Huxford wrote, “His home was visited by the savages on one occasion while the family was absent, and a good deal of vandalism and theft was committed.” John Gaskins and his brother William were among those who took part in the Battle of Brushy Creek, one of the last real engagements with the Creek Indians in this region. At age 38, John Gaskins and family were enumerated in the Census of 1840, still living in the northeast area of old Lowndes county now known as Berrien County. His brother, William, was living next door, and nearby were the homesteads of David Clements and William Clements, and other early settlers. In 1850 the Gaskins remained in Lowndes County. Enumerated nearby the Gaskins home place were the residences of General Levi J. Knight, William Patten, Hardeman Sirmans, David Clements, Moses C. Lee, and other early settlers. John Gaskins was a farmer, with $600 in real estate. Around 1855 the Gaskins were involved in some sort of public disturbance in Lowndes county. Hardeman Sirmons, Benjamin S. Garrett, Drewry Garrett, Will Garrett, John Gaskins, William Gaskins, Gideon Gaskins, and Lemuel Gaskins were all brought before the Lowndes Superior Court for their involvement in a riot. In 1856, however, the Gaskins and their neighbors were cut out of Lowndes county and placed in the new county of Berrien. The defendants were able to have their case transferred to Berrien County in June of 1856, and apparently escaped serious consequences. In the Census of 1860 John Gaskins appeared on the enumeration sheets listed next to Thomas M. Ray, who would begin construction of Ray’s Millpond just a few years later. From 1858 to 1861, John Gaskins served as a Justice of the Peace in Berrien County. During the Civil War five of his sons joined Georgia Volunteer Infantry regiments: Fisher J. Gaskins, William Gaskins, Lemuel Gaskins, Joseph Gaskins, and Harris Gaskins, . Gideon Gaskins, born 1826, Berrien County, GA; married Sarah Knight (July 17, 1831 – February 03, 1902); buried Riverside Baptist Church, Berrien County, GA.
Fisher J. Gaskins, Sr., born February 16, 1828, Berrien County, GA; married Elizabeth Sirmans, daughter of Abner Sirmans; served in Company I, 50th GA Regiment; died November 14, 1908, Berrien County, GA; Buried at Riverside Baptist Church. 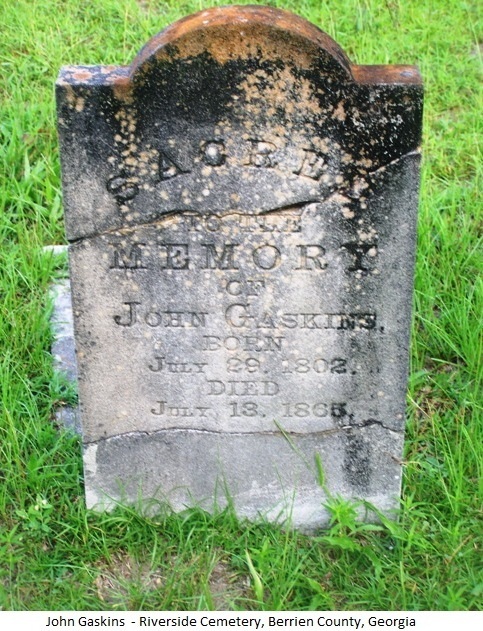 John Gaskins, Jr., born January 16, 1830, Berrien County, GA; married Catherine Calder; died May 6, 1886. Emily Gaskins, born 1832, Berrien County, GA; married Joseph Newbern. William Gaskins, born March 5, 1833; married Elizabeth Clements, daughter of David G. Clements; served in Company I, 54th GA Regiment; died August 27, 1910; buried Empire Primitive Baptist Church Cemetery, Lanier County, GA.
Lemuel Elam Gaskins, born 1836, Berrien County, GA; married Sarah Ann Sirmans, daughter of Abner Sirmans; served in Company I, 50th GA Regiment; died October 26, 1862, Richmond, VA; buried Richmond VA, memorial marker at Riverside Baptist Church. Joseph Gaskins, born April 28, 1840, Berrien County, GA; married Harriet Sirmans, daughter of James Sirmans; served in Company I, 50th GA Regiment; died February 4, 1911; Buried at Riverside Baptist Church. 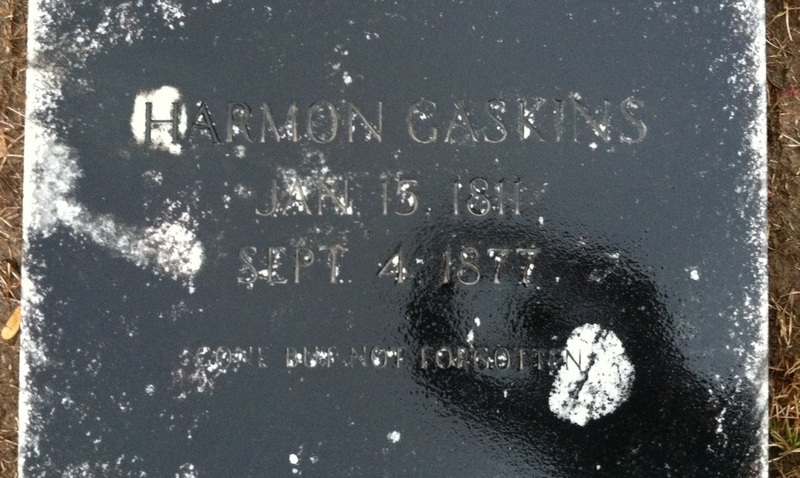 Harmon Gaskins, born 1842, Berrien County, GA; died young. Oldest son of Fisher Gaskins by his first wife. Came to Berrien while a youth, grew to manhood here. His wife was a daughter of Joseph Barrow… Immediately after their marriage John Gaskins and his wife settled on the Alapaha River a short distance north of the old home of his father and near where Bannockburn now is, and there they spent their entire married life together. The death of John Gaskins occurred at this home July 18, 1865; and 23 years later, January 6, 1888 his widow joined her husband in the spirit-land, at the age of 83. Both are buried at Riverside Cemetery and their graves are substantially marked. They were the parents of a large family of sons and daughters and their living descendants in this county to-day are very numerous. John Gaskins was a man who spent his life at home and gave his time and attention to his avocation. The farm was made self-sustaining; work was the rule and grim want never came to stare the inmates of this farm-home in the face. Food for family and stock was well and abundantly supplied and the excellence of the range went a long way in helping him to provide meat for family and lay up money from the sales of beef-cattle. Deer and turkeys were plentiful and could be taken at any time. Fish abounded in the river and with all of these good things around life on the frontier was not so bad after all. Hogs grew almost wild in the hammocks and only required a few weeks’ finishing off with corn or field crops to be ready for slaughter. Cattle were let to go at large all the time except they were penned regularly for about six weeks during the months of April and May so that they may be marked and branded and kept under control; and the annual sale of these beef-cattle brought the gold in their homes against the rainy-day and old age. Following the death of John Gaskins in 1865 his sons Fisher J. and John, Jr. served as the administrators of his estate. Two months after date application will be made to the Court of Ordinary of said county for leave to sell the lands belonging to the estate of John Gaskins, Sen., deceased, for the benefit of the heirs and creditors of said deceased. Over the course of his life, Harmon Gaskins twice married widows named Mrs. Jones. He first married Melissa Rouse Jones, widow of Clayton Jones, and second married Mary McCutchen Jones, widow of Matthew Jones. For nearly forty years, Harmon Gaskins and his family lived near Five Mile Creek, about six or seven miles northeast of present day Ray City, GA.
Harmon Gaskins was one of the early pioneers of Berrien County, originally settling along with his father, Fisher Gaskins, and brothers John and William near present day Bannockburn, GA. They made their homes on the west side of the Alapaha River about 16 miles distant from today’s Ray City, GA location. It was about this time that Harmon’s father, Fisher Gaskins, began to expand his livestock operations. Soon he was looking to acquire good land on which to raise his growing herds of cattle. By 1812, Harmon’s father had moved the family to Telfair County, GA where there was good grazing land for his cattle. His father was very successful in the cattle business and soon had large herds, not only in Telfair County, but also in Walton and other surrounding counties where good natural pasturage could be had. Around 1821, Harmon’s father moved his family and cattle yet again, this time to the newly created Appling County, GA, south of the Ocmulgee River. Harmon Gaskins, now a lad of 12 or 13 years, moved with the family. By the end of 1825, the Georgia Legislature formed the new county of Lowndes out of the southern half of Irwin County. It was around that time or shortly thereafter, Harmon’s father brought his cattle herds and family father south into that portion of Lowndes County that would later be cut into Berrien County. Fisher Gaskins (Sr.) brought his family into Lowndes County and settled west of the Alapha River perhaps a little south of the present day Bannockburn, GA, and about 15 miles north of the area where William A. Knight, Isbin Giddens, and David Clements were settling their families above Grand Bay. Around 1832, Harmon’s father moved farther south into Florida where it was said that there was even better pasture land for cattle. Harmon stayed behind, as well as his brothers, William and John. 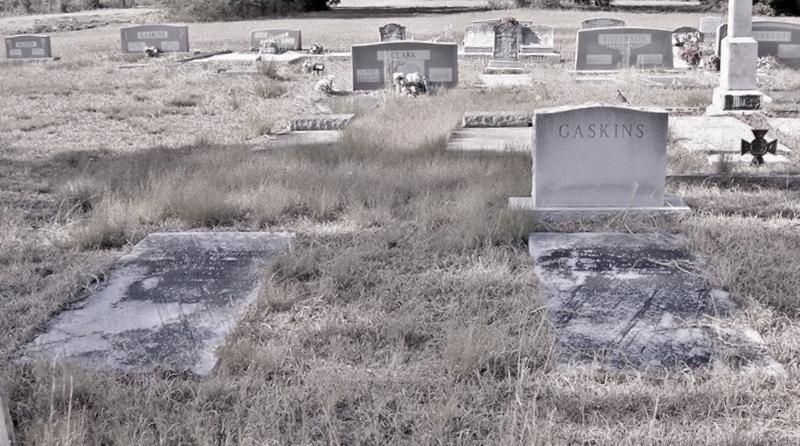 Harmon Gaskins married about 1835 and first established his own home place on the Gaskins land near Gaskins cemetery. Harmon Gaskins, and his brothers William and John, were among Captain Levi J. Knight’s Company of men who fought in the Indian Wars of 1836. Many published accounts of the pioneer skirmishes with Native Americans at William Parker’s place on the Alapaha River and at Brushy Creek have been related on the Ray City History Blog. In the late 1830s, Harmon Gaskins moved his family to a location near Five Mile Creek, about six or seven miles from present day Ray City, GA. The Census of 1850 shows the Harmon Gaskins place was located next to the farm of Mark Watson, which was in the area of Empire Church. Harmon Gaskins kept his residence here until 1875, when he decide to build a place nearer the Alapaha River. Just two years later, Harmon Gaskins died and was buried at the Gaskins Cemetery, Berrien County, GA. This the youngest of the three sons of Fisher and Rhoda Rowe Gaskins, was born in 1808, and began life for himself as a laborer on the farm of a neighbor, Mrs. Clayton Jones. He was about grown when his father decided to move to Florida; and ere long he was in love with Mrs. Melissa Jones, widow of Clayton Jones. Mrs. Jones’ husband had moved to this county from Emanuel County along with the Sirmans family of Clinch and Berrien counties. Her husband died about 1830 or 1832 and left her with three children, viz; Irving Jones and Henry Jones and Harriet who later married Wm. M. Avera. The daughter Harriet was only about two or three years old when her father died, she being born in 1829. Mrs. Melissa Jones was an illegitimate daughter of Miss Martha (Patsy) Rouse who later became the wife of Jonathan Sirmans of this [Clinch] county. The father of this illegitimate child was named Rowland, a fair-haired, blue-eyed Scotch-Irish man of handsome mien and who deceived the youthful maiden and went away never to return. This illegitimate child grew up and married Clayton Jones in Emanuel county, and they came to Berrien county about 1825, and he died about 1830-2 as already stated, leaving his widow possessed of a home and farm and with five children to take care of. Harmon Gaskins, about her age, but a little younger, after working for her on the farm a year or two, proposed marriage and was accepted and they were married about 1835. Their first child Rhoda was born Jan. 17, 1837, at the old homestead which was located on the Willacoochee Road leading east from Nashville by way of Avera’s Mill 7 miles east of Nashville and near the Gaskins Graveyard. The early life of Harmon Gaskins was not different from that of other pioneers’ sons growing up in the atmosphere of frontier life. He was reared to live the chase and many were the conquests made by him in company with his father and brothers of the wild beasts that then abounded and roamed through the country. Like his father and brothers, he became the owner of a vast herd of cattle, and from the proceeds of sales of his beef-cattle each year he was able to save up gold and silver which in his hands stayed out of the channels of trade for years at the time. He was inured to the hardships of life as it then existed. His only mode of travel was horseback unless he had to make a trip to a distant trading-point for supplies that could not be produced on the farm. In such event of a trip, the horse was hitched to a two-wheeled cart of his own construction he being an excellent blacksmith and wheelright; and journey made in company with two or three neighbors situated like himself. They drove their carts sitting astride their horses, and took rest-spells by occasionally walking by the side of the horse. Such trips had to be made to St. Marks, Fla., or to old Center Village in what is now Charlton county. An occasional trip would be made to Savannah but most of the trips were made to the other points named; these trips were usually about once a year, and would last a week or ten days. After the birth of two or three children the homesite of Harmon Gaskins was moved to a different location on the same lot of land and for many years he lived near Five-Miles Creek just east of his first location. This was his home until about 1875 when he decided to locate on a lot of land which he had owned for several years lying nearer the Alapaha River and east of his old home. Here he constructed a plain log dwelling and began the work of making a new home for himself and family, renting out the old home-place. He died at his last location. After the death of his first wife, Mr. Gaskins was married to Mrs. Mary Jones, widow of Matthew Jones and daughter of Robert and Cornelia McCutcheon, pioneer citizens of Irwin and Berrien counties. By his two marriages, Mr. Gaskins had fourteen children – nine by his first wife and five by the second wife. Harmon Gaskins’ death was sudden and was deemed by his older children to appear to have been surrounded with peculiar circumstances. A suspicion arose that he was poisoned by his wife. This suspicion was nursed and grew in the minds of the children until it was determined several weeks later to have the body exhumed and a post mortem examination of the stomach made. The State Chemist failed to find any trace of poison and the decision reached that he came to his death by natural causes. This however engendered much bitterness and ill-feeling between the widow and her step children, and she entered suit for damages for slander. She was given a verdict for $1600.00. She later married Alfred Richardson by whom she had four children, and with whom she lived until a few years before her death in 1918. Harmon Gaskins enjoyed but few and limited opportunities for obtaining an education. Nevertheless he was one of the best-posted men on political issues and economics of his time. He was a liberal subscriber to the newspapers of his day, and he had a good collection of books on history and other subjects of all of which he was a great student. His counsel was found to be safe and his judgement sound; he was often sought after by others. He was appointed one of the first judges of the Inferior Court of Berrien County, serving many years. After the court was abolished he served many years as Justice of the Peace. However, he never sought political office but rather preferred to stay home. He labored with his own hands as long as he lived, and put in a good day’s work the day before he died. At the death of his father in Columbia county, Fla., he inherited a large stock of cattle from the estate which ranged in Volusia and St. Johns counties, Fla., and until a few years preceding his death he made trips down there once a year for the purpose of rounding up the cattle, marking and branding the calves, and talking over his business affairs with those he had arranged to look after the herds. The men were usually men living in the neighborhood there and under their contract were to look personally after the cattle and pen them about three months in the spring and each summer in order to keep them tradable, and sell the beef steers in the summer, and bring the money from the sales to the owner. For this service the herder was to receive every fifth calf raised and these calves were marked and branded for the herder at the April round-up. Incompetent and probably dishonest herders in due time began to appear among those entrusted with the care of the Florida herds, and this with the gradual failing of the range and the development of the country there and the influx of people, all worked to the detriment of the enterprise. The income from the cattle grew less each year until Mr. Gaskins decided to sell what he had left and let Florida cattle growing alone. Thus he sold out about 15 or 20 years before he died. After his death some sixteen hundred dollars in gold and silver coin and several hundred dollars in paper money was divided among his heirs after having lain in his trunk for many years. (1) Rhoda, born Jan. 17, 18–, married first to Francis Mobley and after his death in the civil war she married Wm. M. Griner. (2) Martha, married first to Thomas Connell who was killed in the civil war; second to William Parker who died three months later; third husband, Hardeman Giddens, was a first cousin on her mother’s side. (3) Nancy, married Solomon Griffin of Berrien county. (4) Fisher H., married Polly Ann Griner. (5) Harmon Jr. Never married, died a young man during the war. (6) Rachel, married William Griffin. (7) Sarah C., married Samuel Griner. (8) Thomas H., married Rachel McCutcheon. (9) John A., married Mary Bostick. The children by the second wife were: Wayne and Jane who died in childhood; Harmon E. Gaskins, never married, living single in east Berrien county; William H. Gaskins and David D. Gaskins, The latter married Elsie Hughes. 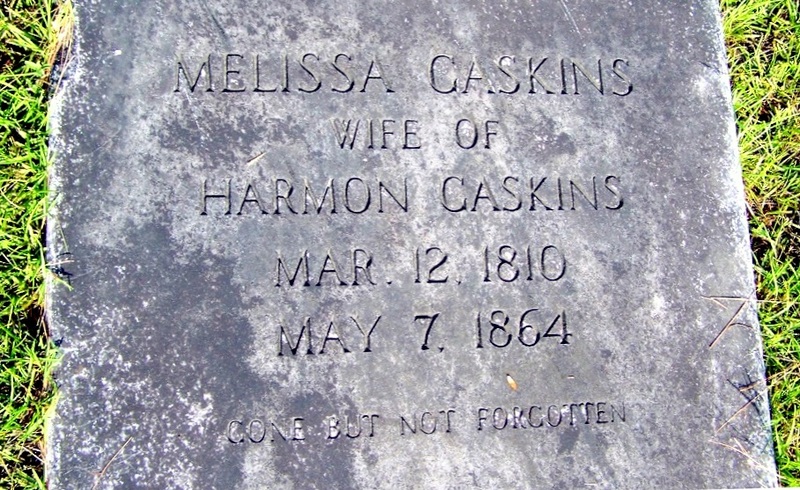 Grave of Melissa Gaskins, 1810-1864, wife of Harmon Gaskins, buried at Gaskins Cemetery, Berrien County, GA.
An incomplete sketch of the people, places, and historic events of Ray City, Georgia. A local history project of the Ray City Community Library.